Net neutrality really is the hot topic at the moment. After the FCC slapped Comcast for slowing down BitTorrent users, Canada is now looking into the network management practices of its ISPs. And rightly so, as a CRTC investigation reveals that most of the ISPs in Canada actively slow down customers using P2P applications. 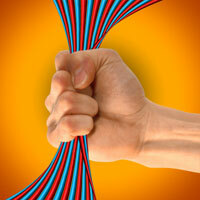 Ignited by the Comcast fiasco in the US, the concept of net neutrality has certainly been brought into the mainstream. ISPs are rarely transparent when it comes to their throttling, capping and otherwise interfering behavior, but in Canada they had to come clean due to a CRTC investigation. The Canadian Radio, Television and Telecommunications Commission (CRTC) is currently looking into the traffic management practices of Canadian ISPs, which came to a head as a result of a dispute between CAIP, and its wholesale provider, Bell. The core objectives of the investigation are to examine the Internet traffic management practices being used, and check that they are in accordance with the Telecommunications Act. The CRTC is looking at the effects of filtering on both regular customers and wholesalers, and the results of the first round of questions are just in. Even though some of the responses are filed in confidence (summarized by Chris Parsons), there is enough information to conclude that all major ISPs slow down customers, with most specifically targeting peer-to-peer traffic. In their response to the CRTC investigation, Bell, Cogeco, Rogers and Eastlink all admit to slow down P2P traffic, arguing that it negatively affects network performance. Shaw, one of the other big players, admitted that customers are slowed down, but most of its responses were filed in confidence and P2P was not specifically mentioned. Bell was more open about its practices, and admits using deep packet inspection (DPI) to throttle its individual customers and wholesalers. On Bell Wireline, P2P traffic is slowed down between 4.30 PM and 2 AM. To cope with the increasing bandwidth demands of its customers, they further plan to disconnect heavy users and introduce metered plans where customers pay for the bandwidth they use. Cogeco started to throttle P2P users back in 2001, when they were only using a tiny fraction of what they do now. However, it was seen as necessary because of the increasing load these users put on the network. Like other ISPs, Cogeco considered other options such as metered plans, but these would not solve the network ‘abuse’ by P2P users. Furthermore, the ongoing battle with P2P users who strive to evade their management solutions led the ISP to use deep packet inspection (DPI) as well. Shaw filed most of its answers in confidence, but provided a rather paradoxical statement which clearly shows that they slow down upstream traffic. “The traffic management technologies have reduced the rate of upstream consumption to a more manageable rate,” they write, claiming that this allows their customers to reach their full contract speeds. Similar to the other ISPs Shaw is predicting that bandwidth usage will grow, and that traffic shaping is essential to manage their network. In summary, we can conclude that there is no such thing as net neutrality in Canada. All of the larger ISPs slow down their customers, with most of them specifically targeting P2P traffic through deep packet inspection. Because of this, P2P users can’t enjoy the speeds they were promised, and several legitimate businesses whose income depends on delivering content through BitTorrent or other filesharing networks are unable to compete with those who don’t. It’s now up to the CRTC to draw the right conclusions.